Turmeric has proven true to be miraculous. Uses and benefits of this spice are innumerable. Turmeric ideally belongs to the ginger family. It was first found and used in India, the spice country. Still in many part of India, Turmeric is used as a primary spice. The beautiful yellow curry you see that are made in India all have turmeric as turmeric is the only spice that offers hat beautiful color. Did you know this miraculous herb is used as an alternate therapy for cervical cancer? Yes, read to find out. Indian and Chinese medicine knowledge has been adopted in modern medicine as well. Both these cultures liked using turmeric as one of the healing medication during the golden age. What does turmeric do? It heals wound, reduces pain and inflammation, improves digestion, treats liver diseases, improves arthritis and also treats allergic conditions! Yeah, imagine the number of pills it just eliminated! Turmeric is being now studied intensively and many researchers believe that it will replace any medication. Needless to say its 100% organic making it very safe for consumption. But one of the most significant uses of this wonderful spice is in cervical cancer. Curcumin in turmeric helps in inhibiting proliferation (growth) of cells leading to cervical cancer. So, Cervical which rich in Curcumin is found to be useful. When it inhibits the cell it basically kills the cells leading to a reduction in the malignant cell. There are certain portions that help in the promotion of cancer cells. These proteins activity is suppressed by curcumin. Not only does it inhibit the cancer cell growth and protein activity but also inhibit the activity of the COX-2 enzyme as it is an anti-inflammatory. Estradiol is one of the hormones produced in the female body. When produced it is held as a risk factor for cervical cancer. Estradiol does the exact opposite of what turmeric does. Meaning it chooses to protect those nasty cancer cells. These cells then tend to divide fearlessly and lead to malignancy. But now studies have shown the curcumin acts against this protection of estradiol making it difficult for cancers cells to grow. But it doesn’t stop here. It also manages to inhibit telomerase activity. This is helpful as it leads to shortening of telomeres leading to apoptosis (also known as cell death). Telomeres are the fragments found at the end of DNA. Human Papillomavirus is considered to one of a major risk factor in causing cervical cancer. Turmeric has an active ingredient as discussed called curcumin. This active metabolite stops the growth of Human Papillomavirus. It majorly concentrates on decreasing the activity of protein AP-1. In cervical cancer this AP-1 increases and encourages the proliferation of cancer cell. The cell growth depends upon active proteins like nuclear factor-like Kappa B, as they control the inflammation and cell growth process. Curcumin interferes with this proteins activation, in turn, avoiding rest of the consequences following it. Chemotherapy is not easy to undergo as repeated exposure to those strong drugs leads to resistance in our body. But Curcumin in turmeric acts as a sensitizer by increasing the sensitivity of the body towards those drugs, meaning better effect. How Does Curcumin Benefit in Cervical Cancer along with the Prescribed Drug? Paclitaxel is one of the drugs of choice for treatment. Curcumin manages to increase the activity of this drug. If the body instead of rejecting the drug keeps accepting the drug that effectively kills these malignant cell improvement and better results are obvious to be noted. Turmeric exactly does that. When you club all these actions together it becomes slightly easier to beat cervical cancer. 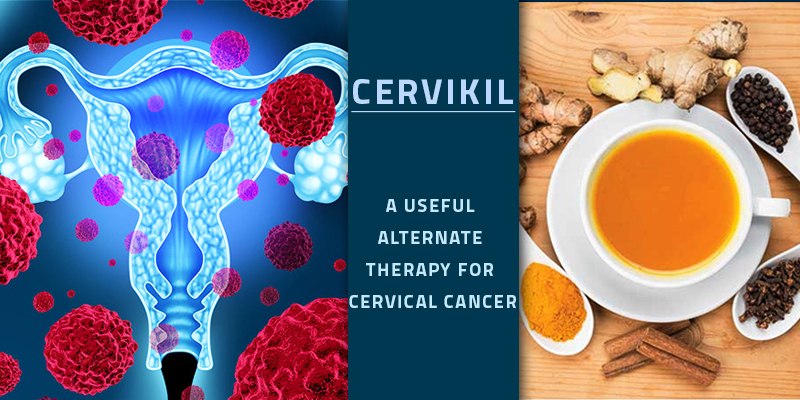 Thus, we know now how Cervikil is a useful alternate therapy for Cervical Cancer. THE HERBAL GOODNESS TO FIGHT CANCER WITH TURMERIC, WERE YOU AWARE?